Landscape and creative photographer Alexander Ipfelkofer’s tells how he made this hot photo of a huge rock Which appears to float in the ocean. PHOTOGRAPHER: In general, I like to photograph a variety of subjects from portrait & street to landscape. I also sometimes do a bit of toy photo (story) shooting. I shoot anywhere and everywhere, I always have my camera with me! When I go to a location I usually think about a theme before going there, and choose my equipment accordingly. PHOTOGRILL: Where was this photo made? PHOTOGRAPHER: All I knew the day before was that I wanted to go to a beach location that offered a cliff or rocks of sorts to do some neutral density, ND10 long exposure shots. I asked around and Kukup Beach came recommended. Upon arrival I scouted the beach first and took a few snaps with the 24-105mm, I liked what I saw so I decided to stay at that beach for the remainder of the day and set up my gear for long exposure. I never drive myself when travelling, it frees up both hands for more photo shooting, plus drivers for the day in Indonesia are not that expensive (8hrs around 30 Euro). 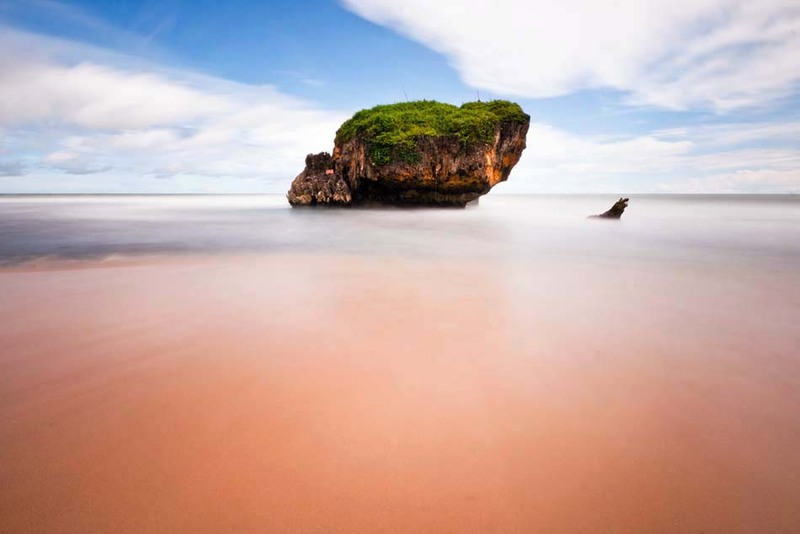 Kukup beach is about 70km (2 hrs) south of Yogyakarta, Central Java in Indonesia and the road to the coast, the last part (20km) is narrow and steep and meandering down to the ocean level. Roads sometimes are in a very bad condition and having a local driver helps! PHOTOGRILL: How did you make this photograph? PHOTOGRAPHER: It’s a long exposure shot with a B+W ND10 filter, that is +10 f-stops! Looking through the viewfinder you won’t see a lot. The tip other photographers usually give is to compose the shot first and then screw on the ND10 filter. I don’t like that since I am in a “wet” environment and would risk getting water on the lens and the filter. Instead I set the LCD to maximum brightness, turned on grid lines and closed the viewfinder so that no stray light would come through and mess up the shot. The main item of interest at this beach is the massive rock. The composition starts before looking through the viewfinder, looking at it from all sides, factoring in the position of the sun, clouds, beach and waves I decide what should be in the frame. I always shoot a subject multiple times from various angles, with certain intentions in mind. For example the rock in the upper third of the frame, with 2/3 of beach below would possibly seem like floating in the air, especially with the long exposure effect of the waves looking like silky foam. People often comment that this photo reminds them of the floating rocks in the movie “Avatar”. PHOTOGRILL: You called this image ‘SkyRock’. Why did you want to make the rock appear to float in the sky? 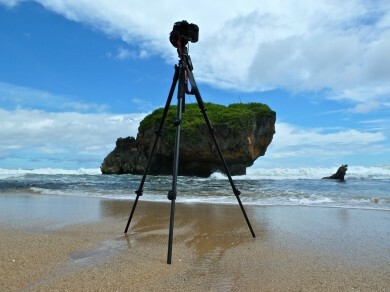 PHOTOGRAPHER: Why do majestic rocks float in the ocean? It’s a magical place that beach, how to transport that to the viewer, how to bring across that tranquillity, the sound of the ocean, the scent of the salt from the waves embracing that rock time and again? This feeling of peace, tranquillity, solitude, bliss for the soul, this is the essence of this shot which I was trying to capture. PHOTOGRILL: What equipment was used, and what technical details? PHOTOGRAPHER: I used a Canon EOS 50D, Canon EF-S 10-22mm at 10mm, Manfrotto tripod & Ball Head, Haehnel Giga-T Pro Remote, B+W ND10 filter. ISO 100, f/22, Exposure: 90 sec. When choosing equipment, the most important part is the lens, not the camera. As long as the camera sensor has decent resolution you will be fine. If you use a cheap lens with that, well, you will see the difference. I am happy with the Canon 50D performance, the only real issue is the viewfinder which only covers 96% of the frame, it should cover 100% and the high end professional cameras usually do. The Haehnel Giga-T Pro is a wired timer remote, it can do anything, spiffy gadget. It was all fun until a big wave came, I quickly grabbed my tripod to lift it out of the water and save the camera, only to drop my remote in the water! Yes, my Haehnel took a dive that day. PHOTOGRILL: What post-processing was involved? PHOTOGRAPHER: I am asked quite often, “so you photoshop your images a lot?” The answer is no, I do not. The modern darkroom (or Adobe’s ‘Lightroom’ in my case) is an integral part of ‘developing’ an image though. For the long exposure photographs in this particular case all I did is to apply the built in Lens Correction profile in Lightroom, that’s it. Yes, those colours are straight out of camera. It is a beautiful place. 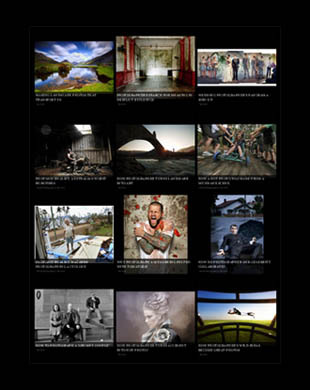 PHOTOGRILL: What drives you to make photos? PHOTOGRAPHER: I want to capture the essence of what I see and transport that to the viewer. This can involve altering reality or reproducing it faithfully and the decision about how to transport that essence needs to be clear in my mind when I take the shot. This is what drives me, getting this vision right. We’ve all heard of the golden hour when light is especially good. At those times and you can make beautiful shots but you can make great shots at any time of day or night as long as you succeed in capturing and transporting the “essence” of the scene. Photography is not a science, the sharpest or best-lit image is not always the “best” image. Location scouting is important to my photography. When hunting for things to photograph I try to reduce the scene into it’s basic shapes and lines, light and shadows, and how they play together to form a unit. This can be quite abstract sometimes, like with “White Light“. Can you guess what it is? Let me know if you do! Quintessentially, I always try and train the eye to see beyond what is on the surface. For me this is key in identifying the essence of what you want to photograph and you can do it anywhere anytime even without camera. Alexander Ipfelkofer’s photography can be found at Flickr, Facebook, Twitter and on Tumblr. This entry was posted on Monday, May 23rd, 2011 at 12:10 pm. It is filed under The Grill and tagged with Creative Photography, Landscape Photography, Nature Photo, Photographic Techniques, Posts Tagged ‘Landmark Photo’. You can follow any responses to this entry through the RSS 2.0 feed. Neil, I didn’t change anything really in that photo as I said in the interview, besides a bit of contrast, the color of the sand is the result of the long exposure with the ND10, since the waves kept washing over the beach the color of the water and the sand in the sun became one, which results in the tone you see. Love that long exposure shot. How did you make sand’s color change to like flesh? Did you use any filter? I love the color effect! I love this image of the “floating rock”. The composition and everything about it is perfect. Thank you for the explanation. I would like to try shooting something similar sometime. 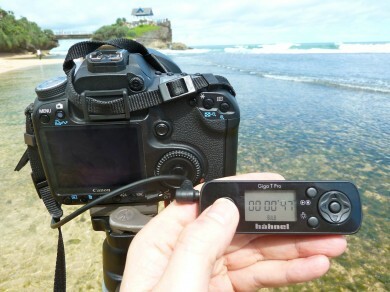 I love the idea to change the lcd-brightness to see through the ND-filter! Fabulous shot, nice job!